Whispers in Autumn-- I'm a Book Aunt!!! Other than my own novels, I’ve never been so proud and excited about the release of a book. Today is the official release of Whispers in Autumn by Trisha Leigh. I’ve known this book since it’s infancy, over two years ago. I’ve seen it in its ridiculously well written first draft. I’ve celebrated this book when Trisha signed with an agent two years ago. Then cried when she left her agent. I’ve stood in Walmart, talking on my cell phone, encouraging Trisha when she wondered if her book would ever be read. 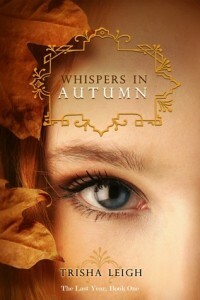 I’ve watched Whispers in Autumn grow and mature from a great story into a fantastic one. I feel like a doting aunt and I am privileged to be so deeply engrossed in the course of its development. Whispers in Autumn is a young adult dsytopian science fiction, but don’t let that moniker scare you. While that might be it’s label, Whispers in Autumn is really the story of a teenage girl who has always known that she is different. Only her difference doesn’t just make her lonely, it’s dangerous. The locket she wears around her neck with a note tucked inside proves it. It tells her that she’s Something Else, there are more like her, but to trust no one. In Althea’s world, people are dutiful and calm and Althea has spent her entire life hiding that she is neither. She’s accepted that this is her life until things begin to change. The Wardens have suddenly announced that they will begin to question students in Althea’s grade. And while her head is swimming with worry that she will be found out, she meets Lucas. She notices right away that Lucas isn’t quite “normal” either, but she’s been told not to trust anyone. Could he be like her? And what about the new boy Deshi? As the autumn progresses, Althea searches for answers because trying to blend in with the rest of society is no longer an option. The Others are trying to search her out and she has to find out why. Whispers in Autumn is not only a gripping story but beautifully well written. Trisha effortlessly blends gorgeous prose with sci fi, dystopian, romance, and a mystery so that you no longer see the monikers but just the story: A girl who not only wants to survive but wants to belong somewhere. Doesn’t this book sound awesome??? Go buy it! Looks really interesting!! I added it to my Nook wishlist! Perfect timing…I just finished a book earlier today. I just purchased this book on your recommendation and managed to sneak in a few chapters already. I’m really enjoying it! Thanks! Your Commentsplease tell me the next book will be released tomorrow. Please??? LOVED this one!! I must admit, it does sound awesome. I’m adding it to my list of books to read and I wish Trisha the very best of luck with it!